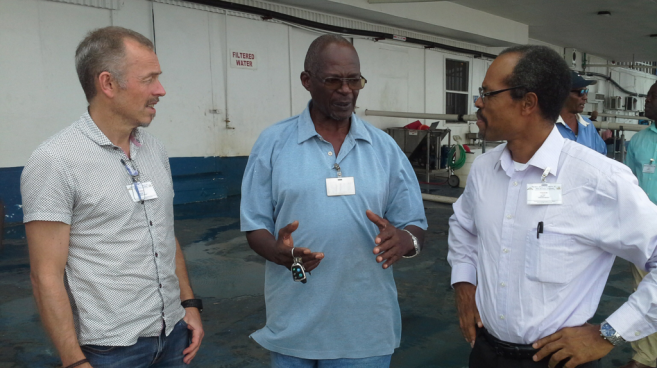 Belize City, Friday, 3 February 2017 (CRFM)—The Caribbean Regional Fisheries Mechanism (CRFM) and a team of Norwegian experts have concluded a successful two-week fact-finding mission in the Caribbean aimed at identifying critical ways in which Norway can support the sustainable development of Caribbean fisheries and aquaculture. 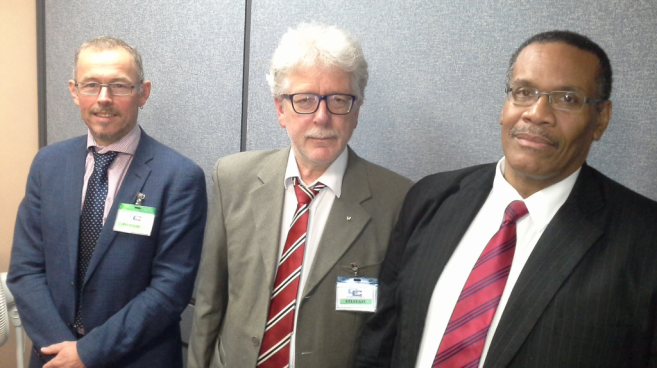 The team, comprised of Milton Haughton, CRFM Executive Director; Dr. Åge Høines, Senior Scientist, Institute of Marine Research, Norway; and Mr. Johán Williams, Specialist Director, Norwegian Ministry of Fisheries and Coastal Affairs, met with Senior executives of the CARICOM Secretariat in Guyana, as well as Ministers, permanent secretaries, chief fisheries officers and other stakeholders in sample countries, affording the team an opportunity to look at the spectrum of fisheries operations across the region in countries and communities with varying types of fisheries and levels of development. The 7 countries covered in the mission were The Bahamas, Barbados, Belize, Grenada, Guyana, Haiti, and Trinidad and Tobago. In Guyana, Agriculture Minister Noel Holder said that not only is the cooperation timely but it also augurs well for research and management of the fisheries sector. 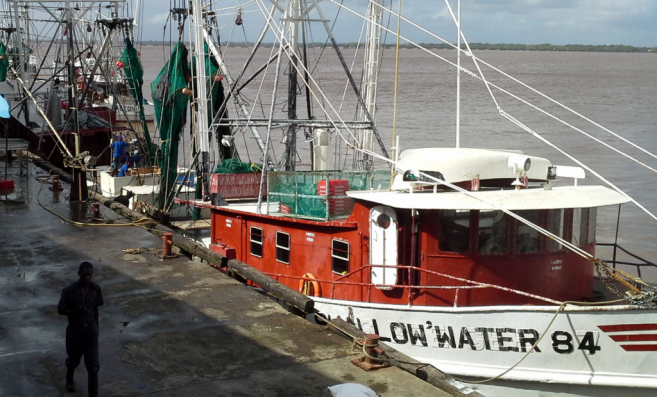 “It is important to build on the capacity which already exists and expand, to ensure that Guyana’s fisheries sector continues to thrive…,” the Minister said. On receiving the mission in Trinidad and Tobago, Mrs. Angela Siew, the Permanent Secretary (Ag.) in the Ministry of Agriculture, Land and Fisheries in that Member State, said that she was thrilled at the timing of the proposal espoused by the technical mission from Norway. "I am particularly pleased with the capacity-building objective of the programme, as the current economic tides have gravely impeded the Ministry's staffing within the Fisheries sector. The programme, therefore, presents a unique and much needed opportunity for the human resource capacity to be enhanced within the fisheries sector," Siew was quoted as saying in a government news release. Apart from helping CRFM Member States to improve evidence-based management of the region's fisheries resources and associated ecosystems, the effort, which the parties hope will result in a regional project to be launched in the latter half of 2017, is also geared towards bolstering trade by improving the Caribbean's competiveness on the world market. 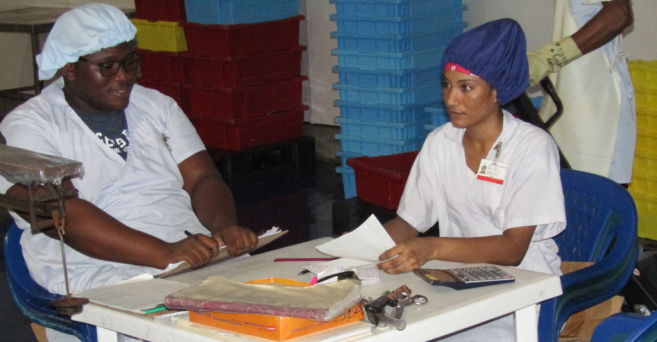 Plant workers at this processing facility in Guyana could also benefit from the proposed initiative to strengthen fisheries data, establish traceability of fish catch and improve catch documentation. More specifically, future collaboration should aim at helping Caribbean countries to strengthen fisheries data, establish traceability of fish catch and improve catch documentation to ensure that investment and policy-decisions are based on good science, as well as safeguards against illegal, unreported and unregulated (IUU) fishing—a scourge to the Caribbean and the rest of the world. The collaboration between the parties represents the first such initiative undertaken by Norway with Caribbean countries, and via the regional fisheries body, the CRFM. The parties hope to strengthen their cross-hemisphere ties for the long-term, in line with a wider agreement sealed five months ago by the CARICOM Secretariat and the governments of the Nordic countries. That agreement does not only enable cooperation in fisheries, identified as one of the priority areas for attention; it also supports collaboration in areas such as renewable energy, climate change, gender equality, tourism, and information technology. “The Norwegian governance and management system for their marine living and non-living resources is very impressive and has contributed immensely to their national wealth and economic development. Underpinning their exceptional economic performance and high standard of living is a resolute commitment to the collection and use of scientific evidence and knowledge of the marine resources to inform decision-making and policy implementation,” Haughton concluded.